Several years ago, I found a single blue tufted flower growing in the fold on the property – just at the point where the dry creek sneaks under the road before continuing on it’s way through the neighborhood. I took it and poked it into the front tiered planting bed to see if it would reseed. It did… by the hundreds. 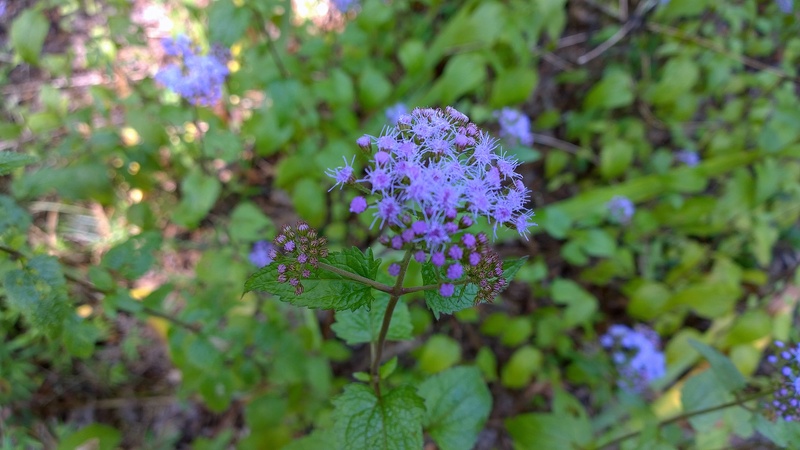 Say hello to Conoclinium (Eupatorium) coelestinum… or Wild Ageratum… or Mistflower. Although, my dad always called it “Millions” because of the number of new plants it produces every year. A branching member of the aster family, Mistflower is easily spotted by the profusion of soft blue tufts, crowning a mass of sturdy, saw-toothed leaves. 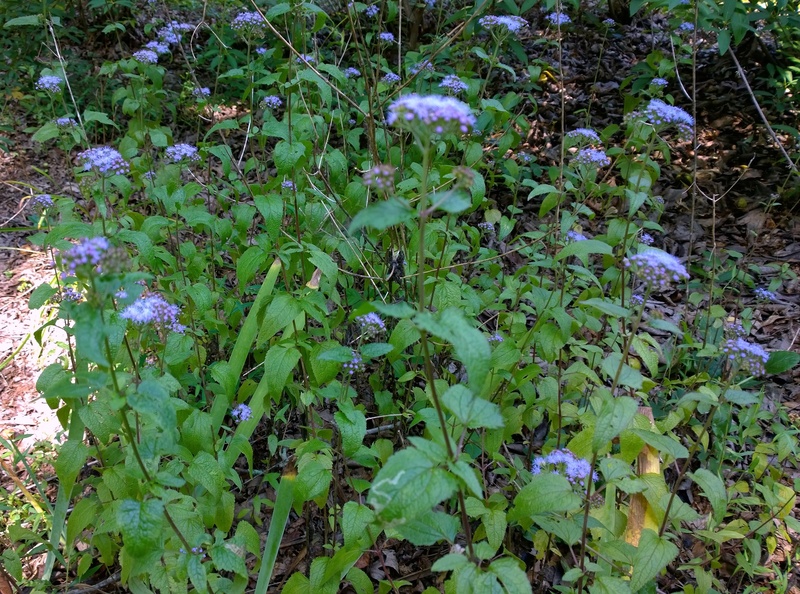 Here in North Georgia, Mistflower begins blooming in early September and blooms through the first heavy frost; meaning we typically get flowers well into October – up to about the 3rd week. Foliage – Foliage appear in early summer, Deep green – Saw toothed leaves arranged opposing on darker (chocolate) branching stems. Care – Minor care needed – Plant reseeds by multiple seed heads and tightly woven root masses and rhizomes. Prefers damper areas. Type – Perennial with new plants augmented by reseeding. Attracts: Butterflies, hummingbirds, bees and moths. Considered Deer and Rabbit resistant because of the extremely bitter taste.